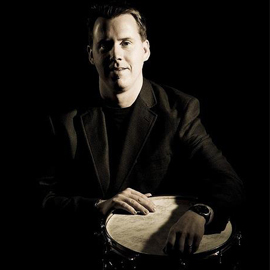 Jeremy Hummel is a professional drummer and educator. He is also a clinician, studio musician and columnist for Modern Drummer Magazine. Jeremy's popularity as an educator stems from his engaging personality and practical concepts. His lessons are fun and sometimes unorthodox. As a player, Jeremy puts his focus on two main projects. He is involved with a jazz trio called "EVE." "EVE" does some fusion, electric dates as well. Jeremy also serves as the musical director of "Into The Spin," an eight-piece horn band. Jeremy's most popular recorded works came with platinum-selling rock artists Breaking Benjamin. He was a co-founding member of the group and played on the band's first two records, "Saturate" and "We Are Not Alone." During his tenure the band scored two #1 hits in the Active Rock Format with "So Cold" and "Sooner or Later." Additionally, Jeremy has recorded with a variety of artists and styles over the years. Jeremy began playing drums at the age of three. He received his first drum kit on his fifth birthday. Jeremy was surrounded by music practically since birth. His father, Vaughn, is a guitarist. "I used to love going to my dad’s band rehearsal. I thought it was the coolest thing and realized at a very early age that music was what I wanted to do with my life." In addition to his father’s influence, Jeremy was also drawn to the larger–than–life theatrics of KISS. "I was just in awe of them," Jeremy recalls. "My mom and dad would wake me up after I went to bed whenever they were on TV." Jeremy began performing in clubs at nine years old. During his formative years, Jeremy played in a band called "Lightning" with his cousin Adam handling the guitar duties. Ironically enough, it was Adam who led Jeremy to the drums – although not intentionally. When Jeremy was very young, he attended a birthday party for Adam. One of Adam's gifts was a toy drum. As the family took turns passing the gifts, the drum came to Jeremy and the rest is history. Throughout his teenage years, Jeremy continued to play live. His practice time consisted of coming up with original beats and playing along to his favorite records. "I used to play along to a lot of records that had mutli-percussion or two drummers," Jeremy offers. "A big one for me was The Allman Brothers Band "Live At Fillmore East." The Allmans had two drummers and I would try and play both parts simultaneously. This was great for working on things like independence, coordination and polyrhythms." For working on his groove, Jeremy played with a lot of hard rock records such as Def Leppard's "Pyromania", Led Zeppelin, AC/DC and Metallica. He also feels his enjoyment of "old school rap and hip hop" helped him with his feel. His broad taste in music has made him the musical chameleon he is today. Over the years, Jeremy spent time in a variety of bands ranging everywhere from blues and jazz to reggae and funk. Jeremy also spent time in a 50s-60s era theme band.